Tonight, I’m giving a talk about hummingbirds at the Northern Great Lakes Visitors Center. This is a full month before we can expect to see the first hummingbirds in our neck of the woods—they usually turn up sometime around Mother’s Day—but just thinking about hummingbirds takes the edge off even the dreariest, coldest April days, and it’s always good to plan ahead regarding the best practices for feeding hummingbirds and providing high quality backyard habitat. 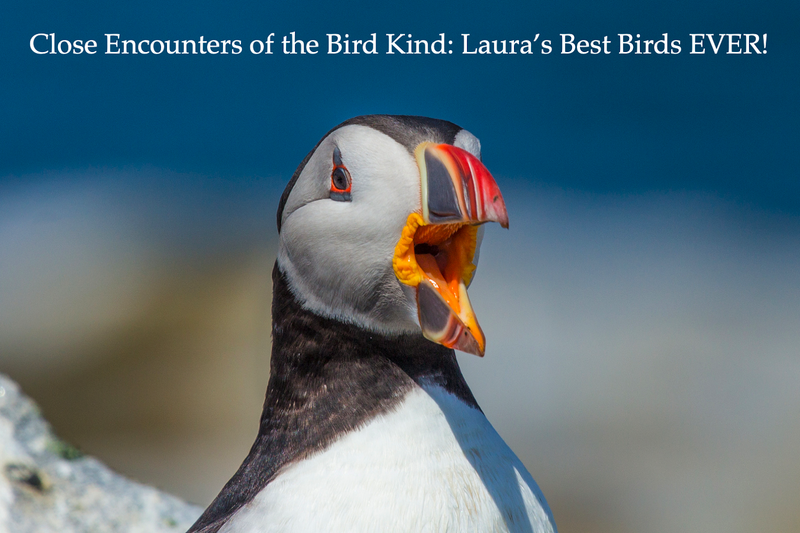 The Internet is filled with advice about birds—it can be very difficult for people to figure out what’s accurate. I’ve read all kinds of misinformation about just about every topic imaginable—birdhouse plans specifically designed for cardinals, even though cardinals are not cavity nesters and never ever use birdhouses; photos of panting, stressed captive Snowy Owls ridiculously described as “laughing”; and recommendations to make sugar water super-strong, with a 1:1 ratio of sugar to water, which is a horrible idea. The sugar water we offer hummingbirds should be of a sweetness comparable to that of natural nectar, which averages about ¼ strength, or a quarter cup of sugar per cup of water. If you want to make things simple, that’s all you need to remember to provide sugar water that will be perfectly fine under any conditions. Some people insist that their hummingbirds only take beet sugar or cane sugar. I’ve never noticed a difference, and many hummingbird authorities claim there is no difference. This feeder is filled with clear sugar water; the pinkish glass makes food coloring utterly worthless as well as harmful. NEVER use food coloring, and never get store-bought hummingbird mixtures that are red. One banded, color-marked hummingbird tracked by hummingbird bander David Patton took about 10 grams of sugar water from one feeder each day, along with using other, natural food sources. 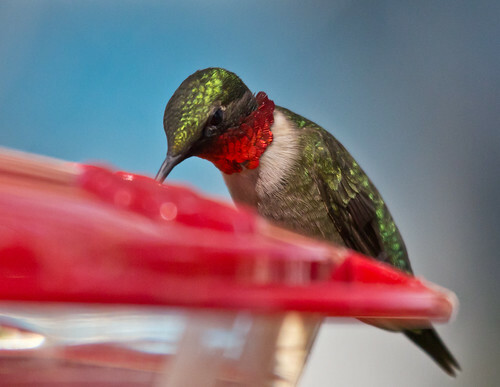 Had that feeder been filled with a popular commercial hummingbird nectar mix, properly mixed with water according to the instructions, the tiny bird would have ingested more than 15 times the amount, for its size, that the World Health Organization recommends as a daily limit for humans. And the nectar taken from a single feeder also would give the hummingbird 12 times the amount of red dye shown to cause DNA damage in mice. When I rehabbed hummingbirds brought to me by people who’d been feeding them red dye in their sugar water, it always took 36 hours or more for the dye to disappear from their droppings. There is absolutely no reason to color hummingbird water: real flower nectar is clear, and hummingbird feeders have plenty enough red to attract the little birds. Also, don’t use honey in place of sugar—it clouds up very quickly, getting contaminated by bacteria and fungus. If you fill your feeders whenever you mix up a new batch of sugar water, there is no need to boil the water first. Even if you mix up a large batch to use as the feeders empty, you don’t need to boil the mixture as long as you put it in a clean container and refrigerate it until use. Make sure you clean your feeders regularly—use a stiff bottlebrush, and make sure there are no little black deposits in the crevices. 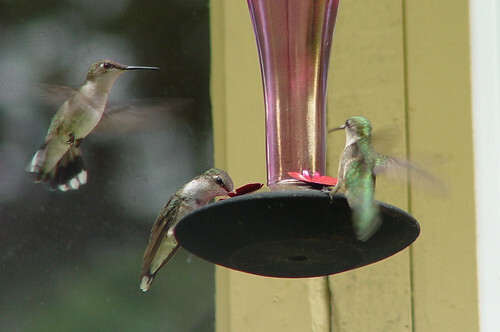 The most important feature to consider when purchasing any hummingbird feeder is that it’s easy to clean. Change the sugar water frequently—every day or two in hot weather. Sugar water slowly ferments, and even if it’s relatively clear, some of the sugar may have been converted to alcohol, bad for hummingbird livers. If it gets cloudy, you’ve waited too long. Natural flower nectar varies in strength. If you want to fine tune the recipe to provide ideal sugar water for differing situations, you can make it stronger, up to about 1/3 cup of sugar per cup of water, during cold, rainy situations. 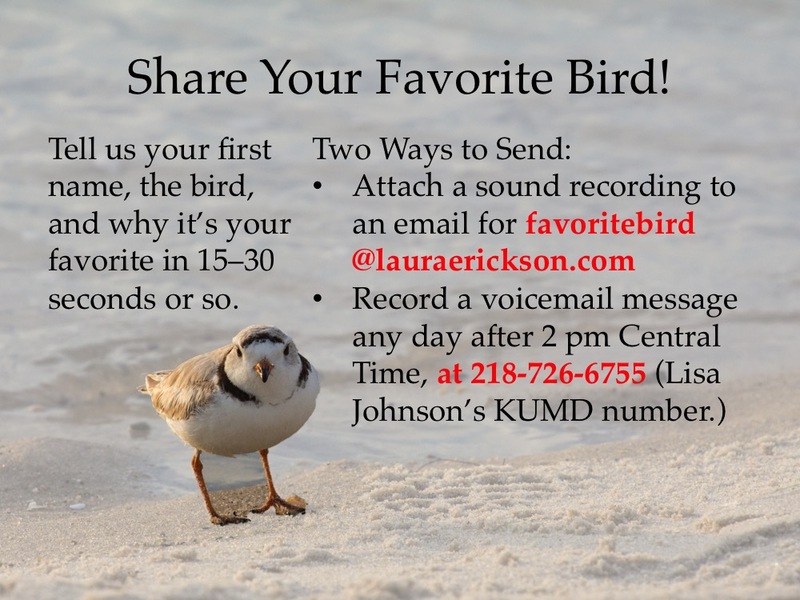 This can provide added calories during migration when birds are burning up energy as they go, or when we have a cold snap right when hummingbirds are incubating eggs, minimizing the time they must be off the nest. During hot, dry spells when water is at a premium, you can make your mixture weaker—about 1/5 cup of sugar per cup of water—especially if hummingbirds in your neighborhood have little access to drinking water. But again, if this is hard to remember, the basic recipe of ¼ cup of sugar per cup of water is fine in all situations. Many hummingbird feeders come with little yellow cage things meant to be put over the feeding ports as “bee guards.” These do keep the bees out of the ports, but with some feeder designs, sugar water almost invariably drips onto the bee guards. On these feeders, wasps and bees may actually sit on the guard getting the sugar water off them. Yellow jackets come to this kind of feeder with or without bee guards. 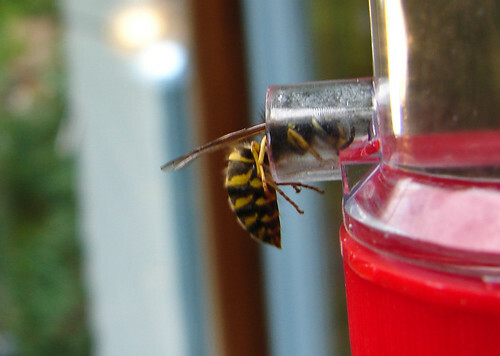 One year when I was working on a book, and so sitting at my desk right next to the window that held my favorite feeder, I couldn’t help but notice that yellow jackets were a serious problem, not only hogging the feeder but actually chasing away the hummingbirds. When I couldn’t stand watching anymore, I finally grabbed our hand vacuum, opened the window, and sucked out several yellow jackets. One female hummingbird took notice. Within a half hour, whenever a yellow jacket took over the feeder, she started hovering at the window, giving me a long hard stare until I got the vacuum and sucked out the problem wasp. The vacuum was noisy, and if I’d turned it on her, it would have sucked her into it, too, but she seemed utterly unafraid—the whole time I was leaning out the window vacuuming up wasps, she’d hover nearby as if supervising. If I didn’t notice her right away when a wasp took over the feeder, she started actually tapping at the window with her beak to get my attention. Hummingbirds are so tiny and vulnerable that it always takes me aback how quickly they figure out which people will do their bidding. Every year delighted hummingbird aficionados tell me stories about the hummingbirds that return year after year and look in the window for them. For weighing a mere eighth to a tenth of an ounce—you could mail ten of them with a single stamp—they are astonishingly intelligent and have long memories. Their lives are treacherous, yet some banded Ruby-throated Hummingbirds have lived at least 9 years thanks to their intelligence, which can temper a natural wariness with learned discrimination. Vacuuming problem wasps is a non-toxic way of dealing with them, but it still made me sad about killing the insects. One of my friends worked out a way of banishing his wasps from his favorite hummingbird feeders: he filled one feeder with a concentrated sugar water mixture with a 1:1 ratio. Wasps prefer far stronger sugar mixtures than hummingbirds do, and so the wasps gravitated to that feeder, leaving the other feeders for the hummers. He moved the wasp feeder further and further from his house, and within a day or two his wasps were in the furthest reaches of his backyard while he enjoyed his hummingbirds and they enjoyed safety. This of course isn’t a good solution if you, your family, or any neighbors are allergic to stings, but was the ideal solution for him. One kind of hummingbird feeder comes with a built in ant-guard—a moat in the center which should be filled with water. Ants can’t swim, so that keeps them from getting to the sugar water. Where ants are a problem, use that kind of feeder or a hummingbird feeder suspended from a hook with ant guards in place above the feeder. A good ant guard is nothing but a water-filled cup that keeps ants from reaching the feeder below. Hummingbird feeders are all you need to attract a few hungry migrants passing over. That is as important for them as restaurants are for hungry human travelers. But hummingbirds need a lot more than sugar water to survive. 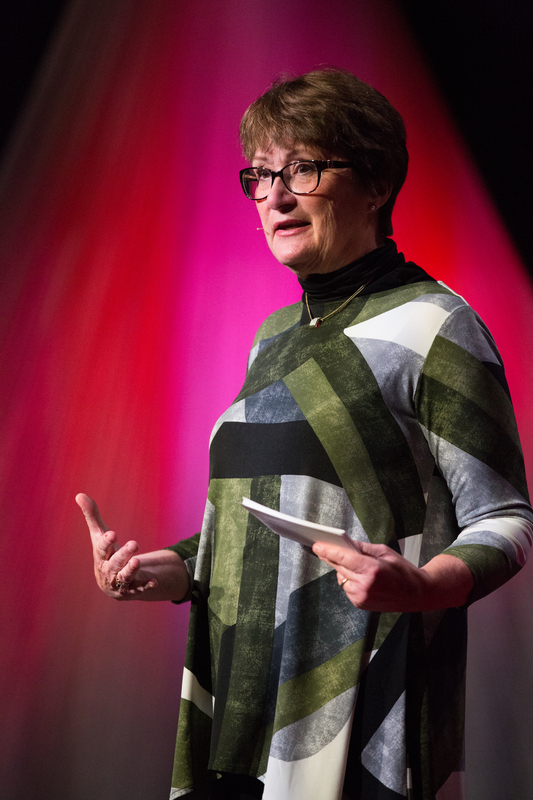 If you want some to stick around your neighborhood beyond migration, you’ll need to build up your backyard habitat. As more and more of America falls into private hands and more and more public land loses the protections that have guarded our country’s wildlife, our backyards are becoming increasingly critical to provide essential habitat for wildlife. 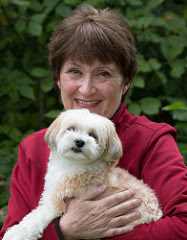 This of course has a dark side as more and more people and their pets encounter predators, hungry but skittish skunks, and other creatures it’s not always easy to deal with—including the wasps I complain about. This problem is growing in part because so many people were never educated, at home or school, about wildlife. To make our backyard habitat friendly to hummingbirds through the breeding season, we must make sure it provides a balanced diet for adults and the young, a safe place to build a nest, and appropriate nest materials. 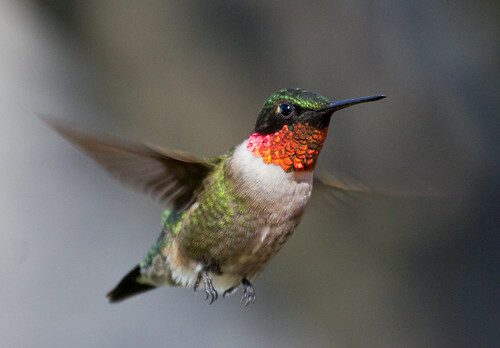 During migration and any cold days after resident birds arrive but before flowers open, hummingbirds get essential carbohydrates from sap oozing from tree buds and sapsucker drill holes. Aspens are ideal for being inexpensive, locally native trees that provide both, and may draw sapsuckers away from more expensive ornamental trees, to boot. In our area, the number one factor that makes it likely that hummingbirds will nest nearby is a resident Yellow-bellied Sapsucker. Nectar-bearing flowers are also great invitations to hummingbirds. 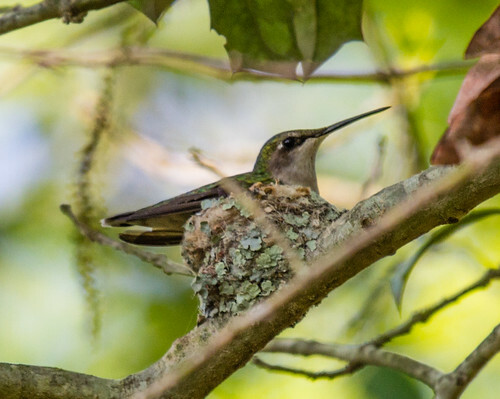 Choosing species and cultivars native to our area will ensure that good insects are attracted to them, too—hummingbirds need a lot of protein, both for the adults and for growing nestlings, and tiny insects provide all of this. Jewelweed, columbine, and lots of other flowers are ideal. Carrol Henderson’s Landscaping for Wildlife, published by the Minnesota DNR, is a great book for giving plant suggestions for our area. When you purchase flowers for your yard, make sure no systemic pesticides were used on them. The lichens making this nest both strong and camouflaged are held together with spider silk, which also holds the nest to the branch. The nest will stretch to accommodate the growing young. It’s impossible for hummingbirds to build nests without two essential materials—lichens and spider silk. If you have a backyard pond or birdbath on the ground, lichens may soon appear on any moist rocks nearby. A few dead trees or snags can also provide a substrate for lichens to grow. If you discover spider webs along your eaves, don’t be too quick to knock them down—hummers and some other small birds may need them. And avoid using any insecticides on your property—you can poison both the insects hummingbirds need for food and the spiders they need for silk. 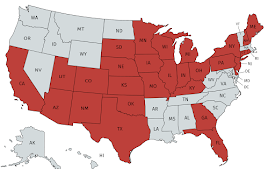 Every year I like to anticipate hummingbird arrival, so I check the internet map on Hummingbirds.net starting in February when more and more suddenly appear along the Gulf Coast. Throughout March and April, they continue to advance. The man who puts together the map, Lanny Chambers, uses a different color each month to make the progress more clear. As of April 9, there had already been a few sightings in central Indiana and several in Illinois along the Mississippi River. 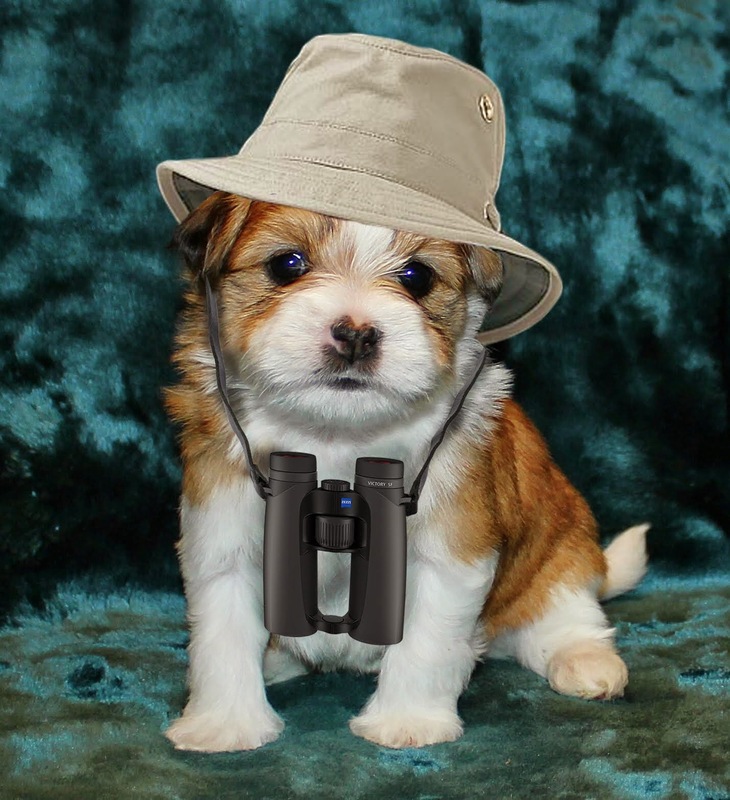 As the month proceeds, you can watch the sightings creeping northward. It’s fine to set out your feeders a few days before they arrive so the very first ones don’t have trouble finding food, but make sure to keep the sugar water fresh. 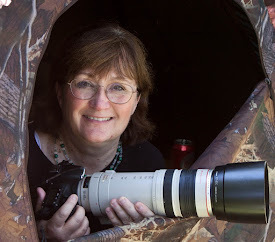 Reporting your own sightings to hummingbirds.net and also to ebird.org will help scientists track this information, which is useful for many conservation and education purposes. But even if you don’t report your own sightings, enjoy the ones at hummingbirds.net so you can get your feeder out as soon as hummingbirds appear up here. Meanwhile, just thinking about them may warm your heart.